1. Firstly, insert the Microsoft Office CD and copy all its contents into a particular folder on your hard disk. 2. Now, go to Files> Setup, right click on the ‘Setup.ini’ file, Select ‘Properties’ and uncheck ‘Read-only’. This will allow you to edit the file. 3. 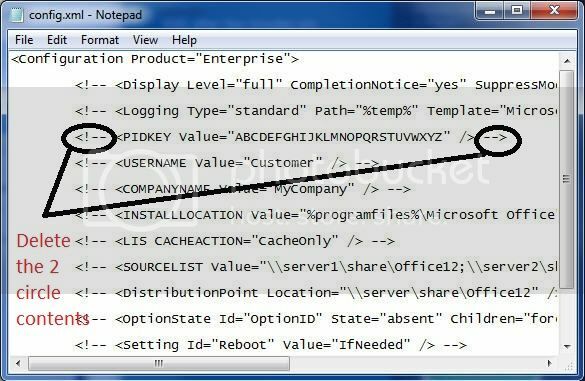 Open ‘Setup.ini’ using notepad or WordPad, locate [Options] and right at the bottom of the options, type PIDKEY=’product key’. Replace the ‘product key’… with your genuine Office product key. 4. Save the setup.ini file and burn all the files to a new disc if you need to. Well, sometimes launching the installer from the hard disk also works out, in such a case you don’t really need to burn the contents. Now whenever you run Microsoft Office installation, you will notice that the product key has been auto inserted in the box. This will save a lot of time as you don’t need to enter looking at the box. For Office 2007, look for a folder with the name Enterprise.WW/ Standard.WW/ Pro.WW in the Office 2007 folder. Edit the config.xml file, remove the comment out code for PIDKEY and enter the 25 digit Office 2007 CD Key WITHOUT dashes. It should look like the screenshot above.